The current post follows on from a previous discussion of the potential Phoenician/Punic roots of the island-name Thanet and the linguistic, historical and archaeological context and support for such a suggestion. Needless to say, the aim of what follows is not to revisit in detail the arguments made in that post, nor the additional archaeological, isotopic and numismatic evidence for contact between North Africa/the Mediterranean and pre-Roman Britain discussed in three subsequent posts. Instead, the aim here is simply to offer, for the sake of interest, a map and list of the British and Irish place-names that are currently thought by a number of linguists to be of potentially Phoenician/Punic origin, along with a few brief observations on these and their distribution. British and Irish place-names considered to be of potentially Phoenician/Punic origin (image: C. R. Green). With regard to the names themselves, several points can be made by way of a brief introduction. 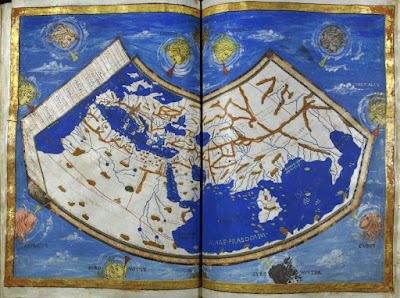 First and foremost, it is worth observing that they are all either coastal or island names, something that obviously accords well with the idea of them having Phoenician/Punic origins, given that any contacts between pre-Roman Britain and the Punic world of southern Iberia and North Africa are likely to have been primarily maritime in nature. 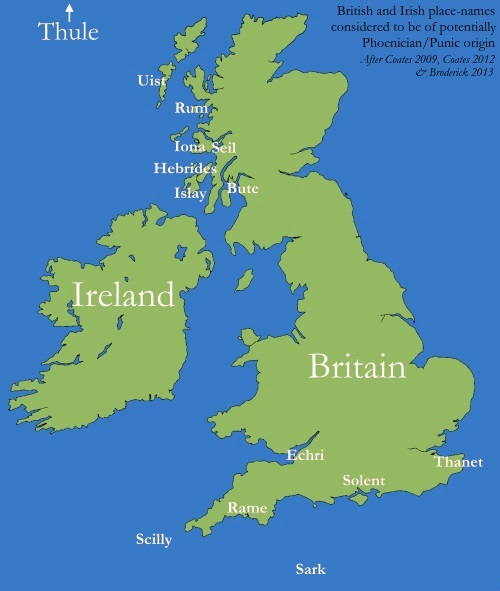 Likewise, the suggested Proto-Semitic/Punic roots identified by Coates and others as potentially underlying these British and Irish coastal/island names are—importantly—plausible in terms of their lexical content too, referring to islands, the coast, cliffs/rocks, plants and animals, relative positions and/or compass points, culturally significant metals, and divine words or names. 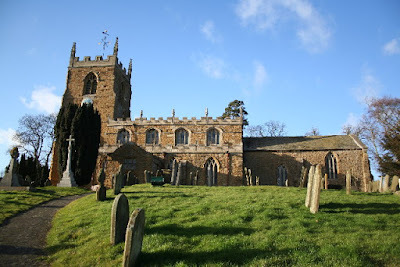 (3) In other words, the basic characteristics of the group as a whole, in terms of not only their general difficulty within the overall corpus of British names, but also their shared geographic characteristics and the range of meanings that they would possess, is credible and might inspire a degree of confidence. A trapezoidal lead core from a Mediterranean Type IIa wooden anchor of the fifth to second century BC that was found in Plymouth Sound, close to Rame Head, one of the potentially Punic names listed below; note, other finds of such early anchor stocks in Atlantic waters are usually thought to be of Phoenician or Punico-Mauretanian origin, see fn. 12 (image: ProMare, CC BY-NC-SA 2.0). In sum, the evidence relating to these names is undoubtedly intriguing and the case for at least a proportion of these names being genuinely Proto-Semitic/Phoenician/Punic in origin would appear to be worthy of at least some serious consideration. Obviously the suggested Punic etymologies for these island and coastal names are open to debate and potential alternative explanations might be advanced for them, with a greater or lesser degree of plausibility. However, what matters is perhaps not any individual name, but rather their collective weight and the fact that a Proto-Semitic/Punic origin both appears to be at least possible and appropriate for a small but significant number of otherwise often very difficult British coastal names. 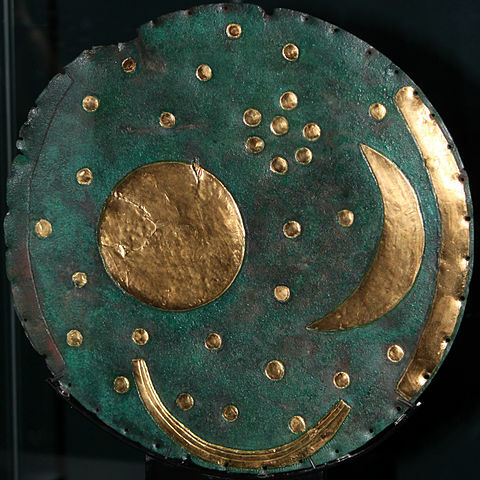 The Bronze Age 'Nebra sky disk' of c. 1600 BC; found near Nebra, Germany, & made using Cornish tin and gold (image: Wikimedia Commons). 1. R. Coates, 'A glimpse through a dirty window into an unlit house: names of some north-west European islands', in W. Ahrens et al (edd. ), Names in Multi-Lingual, Multi-Cultural and Multi-Ethnic Contact: Proceedings of the 23rd International Congress of Onomastic Sciences, August 17-22, 2008 (Toronto, 2009), pp. 228–42 at pp. 234–5; R. Coates, ‘A toponomastic contribution to the linguistic prehistory of the British Isles’, Nomina 35 (2012), 49‒102; G. Broderick, 'Some island names in the former "Kingdom of the Isles": a reappraisal', Journal of Scottish Name Studies, 7 (2013), 1–28; and G. Broderick, ‘The names of Britain and Ireland revisited’, Beiträge zur Namenforschung, 44 (2009), 151‒7. See further C. R. Green, 'Thanet, Tanit and the Phoenicians: place-names, archaeology and pre-Roman trading settlements in eastern Kent? ', 21 April 2015, blog post, online at http://www.caitlingreen.org/2015/04/thanet-tanit-and-the-phoenicians.html; T. Vennemann, 'The name of the Isle of Thanet', in A. J. Johnstone et al (edd. ), Language and Text: Current Perspectives on English and Germanic Historical Linguistics and Philology (Heidelberg, 2006), pp. 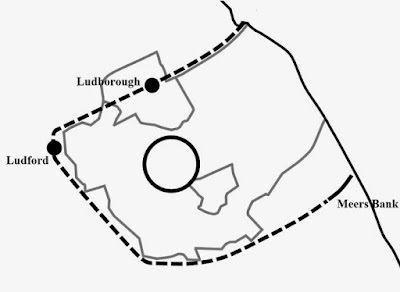 345–74; and T. Vennemann, ‘Remarks on some British place-names’, in G. F. Carr et al (edd. ), Interdigitations: Essays for Irmengard Rauch (New York, 1999), pp. 25‒62. 2. See Avienus, Ora Maritima, LI.108-119; Strabo, Geography, 3.5.11; and especially D. W. Roller, Through the Pillars of Herakles: Greco-Roman Exploration of the Atlantic (London, 2006), pp. 12–14, 27–9. See also D. W. Roller, 'Himilco the Navigator', in E. K. Akyeampong & H. L. Gates Jnr. (edd. ), Dictionary of African Biography, 6 vols. (Oxford, 2012), III.70; T. Vennemann, 'The name of the Isle of Thanet', in A. J. Johnstone et al (edd. ), Language and Text: Current Perspectives on English and Germanic Historical Linguistics and Philology (Heidelberg, 2006), p. 356 and fn. 40; G. Broderick, ‘The names of Britain and Ireland revisited’, Beiträge zur Namenforschung, 44 (2009), 151‒7; and C. R. Green, 'Thanet, Tanit and the Phoenicians: place-names, archaeology and pre-Roman trading settlements in eastern Kent? ', 21 April 2015, blog post, online at http://www.caitlingreen.org/2015/04/thanet-tanit-and-the-phoenicians.html. 3. Coates, ‘A toponomastic contribution to the linguistic prehistory of the British Isles’, passim. 4. Strabo, Geography, 3.5.11; D. W. Roller, Through the Pillars of Herakles: Greco-Roman Exploration of the Atlantic (London, 2006), pp. 12–14; T. Vennemann, 'The name of the Isle of Thanet', in A. J. Johnstone et al (edd. ), Language and Text: Current Perspectives on English and Germanic Historical Linguistics and Philology (Heidelberg, 2006), p. 356 and fn. 40; G. Broderick, ‘The names of Britain and Ireland revisited’, Beiträge zur Namenforschung, 44 (2009), 151‒7. 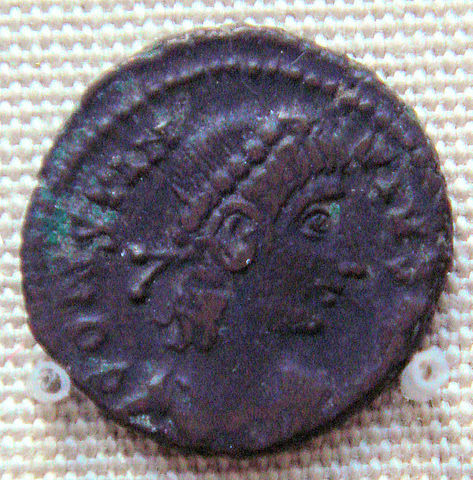 On the export of British tin to the Continent and Mediterranean from the Bronze Age through to the medieval era, see for example J. Ling et al, 'Moving metals II: provenancing Scandinavian Bronze Age artefacts by lead isotope and elemental analyses', Journal of Archaeological Science, 41 (2014), 106–32; M. Hausten et al, 'Tin isotopy – a new method for solving old questions', Archaeometry 52.5 (2010), 816–32; B. Cunliffe, The Extraordinary Voyage of Pytheas the Greek: The Man Who Discovered Britain, rev. edn (London, 2002); and B. Cunliffe, Britain Begins (Oxford, 2013), pp. 319–21. The continuance of this trade into the medieval period is confirmed by a number of sources, including (a) the seventh-century Byzantine Life of St John the Almsgiver, which tells of a ship from Alexandria that visited Britain around AD 610–620 and exchanged a cargo of corn for one of tin, and (b) the thirteenth-century Arabic account of Sa'id al-Maghribi, preserved in the early fourteenth-century Geography of Abu'l-Fida, who mentions the export of 'tin and copper... from the island of England and island of Ireland' to Alexandria, Egypt: Leontius, Life of St John the Almsgiver, chapter 10; C. A. Snyder, An Age of Tyrants: Britain and the Britons, AD 400–600 (Stroud, 1998), p. 152; C. J. Salter, 'Early tin extraction in the south-west of England: a resource for Mediterranean metalworkers of late antiquity', in M. M. Mango (ed. 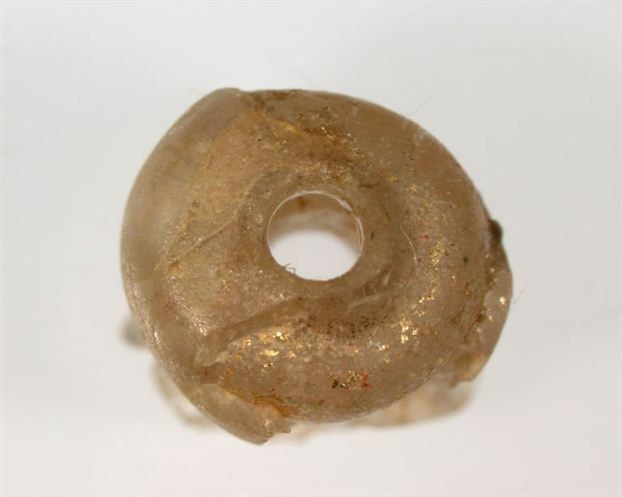 ), Byzantine Trade, 4th–12th Centuries: The Archaeology of Local, Regional and International Exchange (Farnham, 2009), pp. 315–22 at p. 320; and D. N. Dunlop, 'The British Isles according to medieval Arabic authors', Islamic Quarterly, 4 (1957), 11–28 at p. 25. 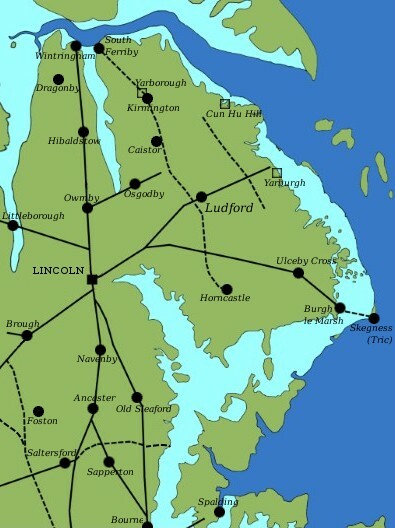 Note, although tin is only found in the south-west of Britain, the spread of names all along the south-coast through to Kent does not conflict with the idea of some connection between them and the tin trade. 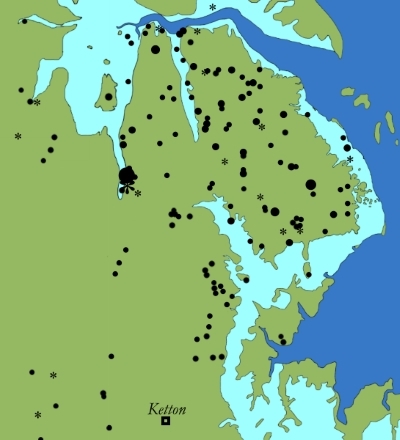 For example, the Isle of Thanet in Kent has recently been identified as a key strategic 'Late Bronze Age trading centre' lying at a mid-point on a trade route between Scandinavia and the Mediterranean and acting as a 'transit centre' for metalwork from other parts of Europe as well as 'providing local tin ore' to these traders (Ling et al, 'Moving metals II', p. 126. See also J. Ling & C. Uhnér, 'Rock art and metal trade', Adoranten, 21 (2014), 23–43, and T. Earle et al, 'The political economy and metal trade in Bronze Age Europe: understanding regional variability in terms of comparative advantages and articulations', European Journal of Archaeology, 18.4 (2015), 633–57, esp. pp. 642–4). 5. On the Barbary ape from Navan Fort, Northern Ireland, see, for example, I. Armit, Headhunting and the Body in Iron Age Europe (Cambridge, 2012), pp. 72–3, and K. A. Costa, 'Marketing archaeological heritage sites in Ireland', in Y. M. Rowan and U. Baram (eds. ), Marketing Heritage: Archaeology and the Consumption of the Past (Walnut Creek, 2004), pp. 69–92 at p. 73. On Pytheas of Massalia, see especially B. Cunliffe, The Extraordinary Voyage of Pytheas the Greek: The Man Who Discovered Britain, rev. edn (London, 2002) and B. Cunliffe, Britain Begins (Oxford, 2013), pp. 319–21. 6. See especially on the etymology of Britain, Ireland and Thule G. Broderick, ‘The names of Britain and Ireland revisited’, Beiträge zur Namenforschung, 44 (2009), 151‒7 and R. Coates, ‘A toponomastic contribution to the linguistic prehistory of the British Isles’, Nomina 35 (2012), 49‒102. For the scientific analysis confirming the presence of Cornish tin on the Continent and in Scandinavia, see M. Hausten et al, 'Tin isotopy – a new method for solving old questions', Archaeometry 52.5 (2010), 816–32, on the Bronze Age Nebra sky disk found near Nebra, Germany, and J. Ling et al, 'Moving metals II: provenancing Scandinavian Bronze Age artefacts by lead isotope and elemental analyses', Journal of Archaeological Science, 41 (2014), 106–32, on the pure Cornish tin ring-ingot found at Vårdinge, Sweden, which is dated to c. 950–700 BC. See, for example, Cunliffe, The Extraordinary Voyage of Pytheas the Greek, on Iron Age references to this trade and Sa'id al-Maghribi's medieval account of its continuance into the thirteenth century, cited in note 4 above. 7. J. Ling et al, 'Moving metals II: provenancing Scandinavian Bronze Age artefacts by lead isotope and elemental analyses', Journal of Archaeological Science, 41 (2014), 106–32; J. Ling & C. Uhnér, 'Rock art and metal trade', Adoranten, 21 (2014), 23–43; T. Earle et al, 'The political economy and metal trade in Bronze Age Europe: understanding regional variability in terms of comparative advantages and articulations', European Journal of Archaeology, 18.4 (2015), 633–57, esp. pp. 642–4. 8. The following list is based primarily on the four papers by Richard Coates and George Broderick cited in note 1, above, supplemented by a number of important papers by Theo Vennemann, cited in the footnotes to the list; note, Vennemann identifies a significant number of potential Punic names in Britain, but these are only listed below if they are discussed and endorsed by Coates and/or Broderick. All names and vocabulary discussed in the papers by Coates and Broderick are listed here, excluding the Isle of Mull, suggested as possibly Punic by Coates but rejected as probably Celtic by Broderick, 'Some island names', p. 13. 9. C. R. Green, 'Thanet, Tanit and the Phoenicians: place-names, archaeology and pre-Roman trading settlements in eastern Kent? ', 21 April 2015, blog post, online at http://www.caitlingreen.org/2015/04/thanet-tanit-and-the-phoenicians.html; T. Vennemann, 'The name of the Isle of Thanet', in A. J. Johnstone et al (edd. ), Language and Text: Current Perspectives on English and Germanic Historical Linguistics and Philology (Heidelberg, 2006), pp. 345–74, especially pp. 345–8, 357–9; R. Coates, 'A glimpse through a dirty window into an unlit house: names of some north-west European islands', in W. Ahrens et al (edd. ), Names in Multi-Lingual, Multi-Cultural and Multi-Ethnic Contact: Proceedings of the 23rd International Congress of Onomastic Sciences, August 17-22, 2008 (Toronto, 2009), pp. 228–42 at pp. 234–5; R. Coates, ‘A toponomastic contribution to the linguistic prehistory of the British Isles’, Nomina 35 (2012), 49‒102. 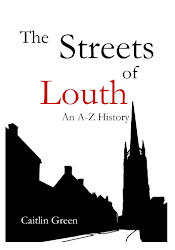 Note, the notion that the name Thanet derives from Greek thanatos, 'death', is a learned folk-etymology, see V. Watts, The Cambridge Dictionary of English Place-Names (Cambridge, 2004), p. 606; R. Coates in R. Coates et al, Celtic Voices, English Places: Studies of the Celtic Impact on Place-Names in England (Stamford, 2000), p. 32; and A. L. F. Rivet & C. Smith, The Place-Names of Roman Britain (Cambridge, 1979), pp. 70, 469. 10. See the references cited in note 7, above. For a brief discussion of the burial site on the Isle of Thanet, see C. R. Green, 'Some oxygen isotope evidence for long-distance migration to Britain from North Africa & southern Iberia, c.1100 BC–AD 800', 24 October 2015, blog post, online at http://www.caitlingreen.org/2015/10/oxygen-isotope-evidence.html, and 'A Mediterranean anchor stock of the fifth to mid-second century BC found off the coast of Britain', 29 August 2015, blog post, online at http://www.caitlingreen.org/2015/08/a-mediterranean-anchor.html. 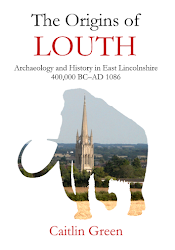 Full details of the site and the burials are available in J. I. McKinley et al, 'Dead-sea connections: a Bronze Age and Iron Age ritual site on the Isle of Thanet', in J. T. Koch & B. Cunliffe (eds. ), Celtic from the West 2. Rethinking the Bronze Age and the Arrival of Indo-European in Atlantic Europe (Oxford, 2013), pp. 157–83, esp. pp. 166–8, and J. I. McKinley et al, Cliffs End Farm, Isle of Thanet, Kent. 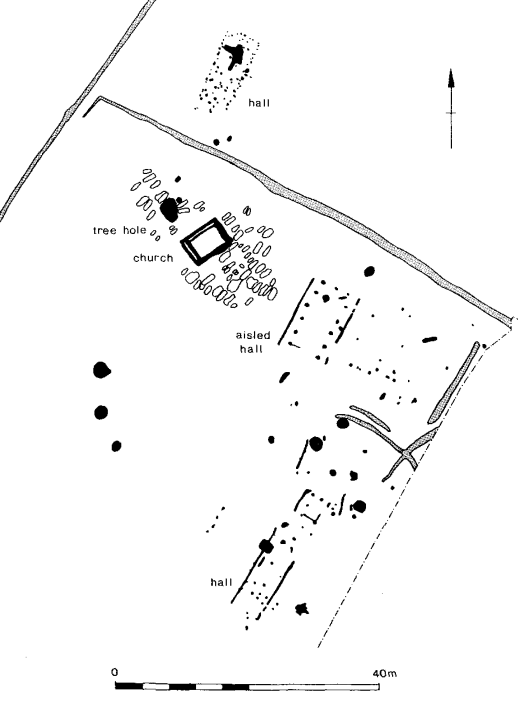 A Mortuary and Ritual Site of the Bronze Age, Iron Age and Anglo-Saxon Period with Evidence for Long-Distance Maritime Mobility (Salisbury, 2014). 11. O. J. Padel, Dictionary of Cornish Place-Names (Penzance, 1988), p. 147; Coates, 'A glimpse through a dirty window into an unlit house: names of some north-west European islands', p. 237; Coates, ‘A toponomastic contribution to the linguistic prehistory of the British Isles’, pp. 80‒1. 12. On the anchor, other finds of such early anchor stocks in Atlantic waters are usually thought to be of Phoenician or Punico-Mauretanian origin: so, a similar Type IIa lead anchor core found at Ras Achakar, Morocco, on the Atlantic side of the Straits of Gibraltar, is thought to have been lost by a Punic ship en route to the important Phoenician settlement of Cádiz, and another Type IIa anchor has been recovered from Cap Spartel, Morocco, that almost certainly dates from the fifth century BC and is similarly though to be from Phoenician/Punico-Mauretanian ship. See further C. R. Green, 'A Mediterranean anchor stock of the fifth to mid-second century BC found off the coast of Britain', 29 August 2015, blog post, online at http://www.caitlingreen.org/2015/08/a-mediterranean-anchor.html. 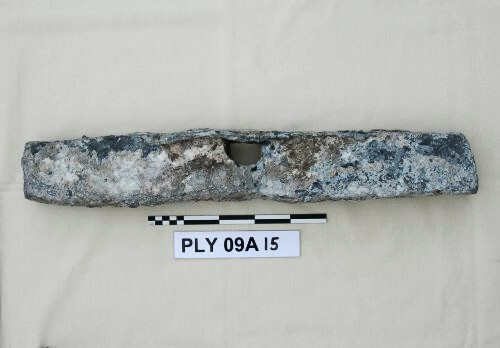 On the Moroccan examples of Type IIa Mediterranean anchors, see A. Trakadas & E. Erbati, 'Lead anchor elements from Tangier, Morocco', Bulletin D'Archeologie Marocaine, 21 (2009), 250–67 at pp. 253–4, 256; A. Trakadas, 'Morocco Maritime Survey: the 2002 season', The INA Quarterly, 30 (2003), 12–21, esp. pp. 18–20 on a radiocarbon-dated Type IIa anchor. 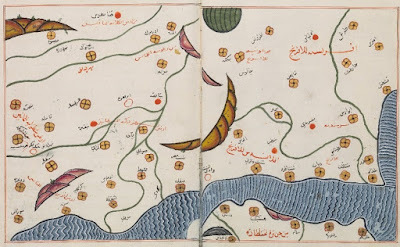 See also A. Trakadas & S. Claesson, 'On the shores of the Maghreb-al-Asqa: the 1999 survey of Tangier Bay, Morocco', The INA Quarterly, 28 (2001), 3–15; A. Trakadas, 'Morocco Maritime Survey: 2003 season', The INA Quarterly, 31 (2004), 3–9, especially pp. 8–9; and E. Erbati & A. Trakadas, The Morocco Maritime Survey (Oxford, 2008), for example p. 63. A fifth-century date for the Cap Spartel anchor core is based on a combination of the general chronology of Type IIa anchors, that is fifth to mid-second century BC, and the fact that the core still had some of its original wooden stock attached which has been radiocarbon dated to 785–400 cal BC. 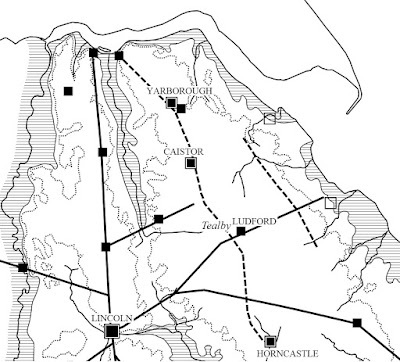 On Mount Batten and Plymouth Sound/the Tamar Estuary, see E. Wilkes, Iron Age Maritime Nodes on the English Channel Coast: An Investigation into the Location, Nature and Context of Early Ports and Harbours, 2 vols. (Bournemouth University PhD Thesis, 2004), I.139–42, II.466–7; A. Firth et al, Tamar Estuaries Historic Environment: A Review of Marine and Coastal Archaeology (Plymouth, 1998); B. Cunliffe, Mount Batten, Plymouth: a Prehistoric and Roman Port (Oxford, 1988). 13. Coates, 'A glimpse through a dirty window into an unlit house: names of some north-west European islands', p. 235, and Coates, ‘A toponomastic contribution to the linguistic prehistory of the British Isles’. 14. Broderick, 'Some island names in the former "Kingdom of the Isles": a reappraisal', p. 11; Coates, 'A glimpse through a dirty window into an unlit house: names of some north-west European islands', p. 237; Coates, ‘A toponomastic contribution to the linguistic prehistory of the British Isles’, pp. 80‒1. 15. T. Vennemann, ‘Remarks on some British place-names’, in G. F. Carr et al (edd. ), Interdigitations: Essays for Irmengard Rauch (New York, 1999), pp. 25‒62 at pp. 40‒2; Coates, ‘A toponomastic contribution to the linguistic prehistory of the British Isles’; Coates, 'A glimpse through a dirty window into an unlit house: names of some north-west European islands', p. 234. On the identification of the Atlantic Kassiterides with the Scilly Isles, see especially D. W. Roller, Through the Pillars of Herakles: Greco-Roman Exploration of the Atlantic (London, 2006), pp. 12–14. 16. R. Coates, ‘Periplus: a voyage round The Solent’, in R. Coates, Toponymic Topics: Essays on the Early Toponomy of the British Isles (Brighton, 1988), pp. 1‒20; Vennemann, ‘Remarks on some British place-names’, pp. 38‒40; G. Broderick, ‘The names of Britain and Ireland revisited’, Beiträge zur Namenforschung, 44 (2009), 151‒7. 17. G. Broderick, 'Some island names in the former "Kingdom of the Isles": a reappraisal', Journal of Scottish Name Studies, 7 (2013), 1–28 at pp. 8‒9; R. Coates, ‘Uist ‒ Ibiza’, in R. Coates, Toponymic Topics: Essays on the Early Toponomy of the British Isles (Brighton, 1988), pp. 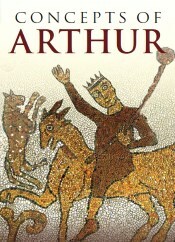 21‒3; Coates, ‘A toponomastic contribution to the linguistic prehistory of the British Isles’, pp. 63‒5. 18. Broderick, 'Some island names in the former "Kingdom of the Isles": a reappraisal', pp. 13‒15; Coates, ‘A toponomastic contribution to the linguistic prehistory of the British Isles’, p. 66; Coates, 'A glimpse through a dirty window into an unlit house: names of some north-west European islands', p. 234. 19. Coates, 'A glimpse through a dirty window into an unlit house: names of some north-west European islands', pp. 233‒4; Coates, ‘A toponomastic contribution to the linguistic prehistory of the British Isles’; Broderick, 'Some island names in the former "Kingdom of the Isles": a reappraisal', pp. 15‒16. 20. See especially Broderick, 2013, pp. 4‒5; also Coates, 2009, p. 234; Coates, 2012, pp. 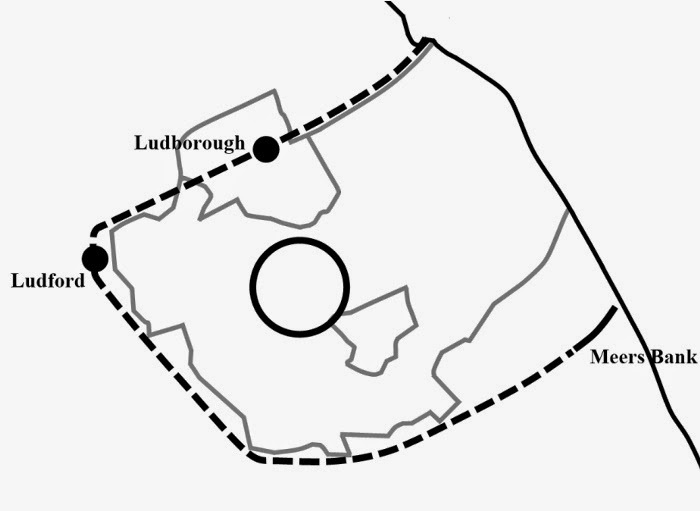 70‒1; and Vennemann, ‘Remarks on some British place-names’, p. 46. 21. Coates, ‘A toponomastic contribution to the linguistic prehistory of the British Isles’, pp. 80‒1. 22. 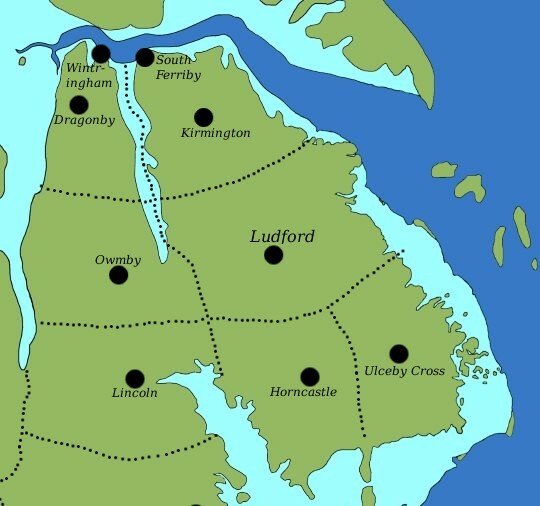 Coates, ‘A toponomastic contribution to the linguistic prehistory of the British Isles’, p. 81, although see Broderick, 'Some island names in the former "Kingdom of the Isles": a reappraisal', pp. 19‒20. 23. Coates, ‘A toponomastic contribution to the linguistic prehistory of the British Isles’; Coates, 'A glimpse through a dirty window into an unlit house: names of some north-west European islands', p. 233. 24. 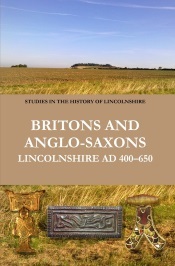 See especially G. Broderick, ‘The names of Britain and Ireland revisited’, Beiträge zur Namenforschung, 44 (2009), 151‒7, who gives a thorough survey of the ancient textual evidence for the tin trade too; also Coates, ‘A toponomastic contribution to the linguistic prehistory of the British Isles’, and T. Vennemann, ‘Zur Etymologie von Éire, dem Namen Irlands’, Sprachwissenschaft, 23.4 (1998), 461‒9. 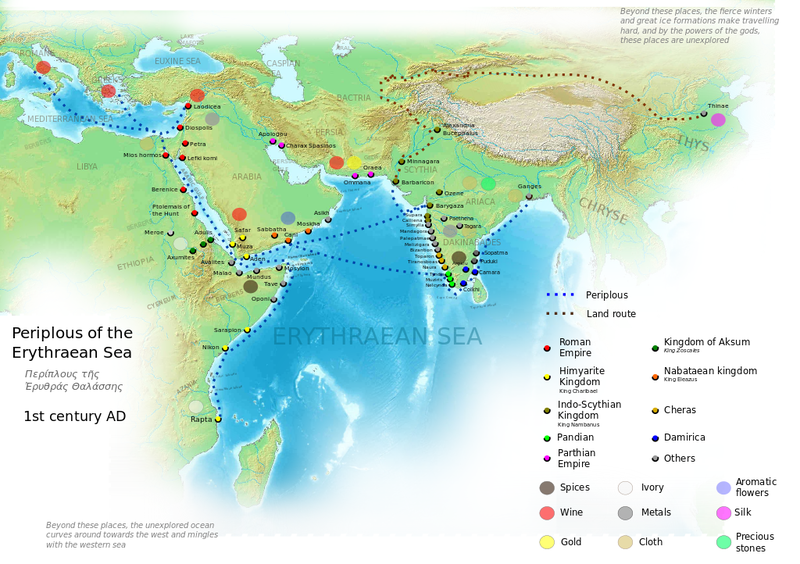 See further the following on Phoenician traders/colonists and the early trade in British tin: D. W. Roller, Through the Pillars of Herakles: Greco-Roman Exploration of the Atlantic (London, 2006), pp. 12–14, 27–9; D. W. Roller, 'Himilco the Navigator', in E. K. Akyeampong & H. L. Gates Jnr. (edd. ), Dictionary of African Biography, 6 vols. (Oxford, 2012), III.70; Vennemann, 'Name of the Isle of Thanet', p. 356 and fn. 40; J. Ling et al, 'Moving metals II: provenancing Scandinavian Bronze Age artefacts by lead isotope and elemental analyses', Journal of Archaeological Science, 41 (2014), 106–32; J. Ling & C. Uhnér, 'Rock art and metal trade', Adoranten, 21 (2014), 23–43; and T. Earle et al, 'The political economy and metal trade in Bronze Age Europe: understanding regional variability in terms of comparative advantages and articulations', European Journal of Archaeology, 18.4 (2015), 633–57, esp. pp. 642–4. 25. See further the discussion in Coates, ‘A toponomastic contribution to the linguistic prehistory of the British Isles’.